This behavior Dog training collar uses vibrations or mild electric shocks to help you positively and harmlessly train your dog. Does your dog exhibit any of the following bad behavior? Excessive barking, biting and other “rough playfulness”, destruction of clothes, furniture, and other property or toileting wherever they feel. Then you should look into purchasing this excellent and effective dog training collar. This collar is an excellent and exceptionally effective device to control your dog’s negative behavior. 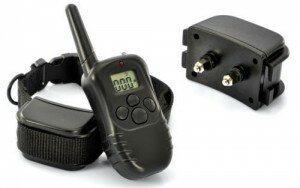 For example, if your dog barks excessively, then this handy gadget is the perfect tool to get them to stop because the remote control allows you to apply a vibration or mild shock to the collar in order to curb their enthusiasm. The shock is not enough to hurt your dog, but just enough to get them to change their behavior. Don’t think of it as a painful electric shock, it’s more like a signal to your dog to act properly. The collar and remote both have a built in battery that can be recharged using the provided adapter and cable.